I've been playing this game and have had tonnes of fun with it. The title "GRiP" got me thinking that it would be interesting to have the different surfaces in the game sport different grip characteristics, like having the sand be very "loose" grip-wise and kinda invite you to slide a bit and take corners sideways over it and have the harder surfaces being more grippy in contrast. I thought that focusing on different grip levels and characteristics would be fitting for a game with this title. I think that's a good idea and that they are going to add different surface grips anyway, but I'm not sure. This also allows the developers to create complete ceiling/walls tracks where you spawn on a 100% grip track, then need to get enough speed to stick to the rest of the track. Every time you fall off due to a mistake or weapons fire you'll respawn on a 100% grip track. Demigan wrote: You could create tunnels with 100% grip (you can stand still on them while upside down) that go vertical. MMmmm... Do you know how gravity works? A smooth surface in general seems like it will generate less grip, right? Since you slip more easily on them. However, a smooth surface also means more of the wheel surface touches the ground, allowing for more... grip. That's why race-cars have smooth wheels, it increases the surface area of the wheels on the track. Of course if there's water on the track it won't be able to get away causing much easier aquaplaning. But there's more. Every surface that touches another surface, such as a car wheel touching the ground, has some molecules form bonds with the ground due to localized extreme pressure on those molecules, litterally making the wheel and surface part of one object. Of course, these bonds are easily broken because there's not many of them but this plays a large part in a surface's "stickyness". Race car wheels, similar to aircraft wheels, heat up from all the friction they endure, and melt slightly. This is done on purpose as the rubber starts to stick more to the ground, allowing the race car to do tighter turns with it's increased grip. It basically allows for the molecules to form these bonds more easily, add the large surface area and you are set for a whole new dimension of grip on your wheels. And lastly, if one of the surfaces is rougher, say the ground, there will be more molecules that get the extreme pressures to bond with the ground, also causing more grip. This one seems the least useful to generate grip in general, as it seems to only work on tough surfaces and any surface based on loose material (sand for instance) would not work as well as simply increasing the amount of touching surfaces. Now for Grip, my money would be on a special semi-sticky surface, like a giant sticky note that is easy enough to pull loose but somehow is sticky enough to stay on something. It would use the same principle as the semi-melted race-car wheels. Magnetism doesn't have anything to do with grip anymore, but with attraction forces. While visually probably a better explanation for most people, I think we can safely use some kind of super-surface, even based on Van Der Whaal Forces (same stuff that allows insects and Ghecko's to walk on walls without using any adhesive material) to do it. In fact, we already are producing stuff that might allow humans to climb walls without problems, so I wouldn't be surprised if entire walls and ceilings couln't be made for vehicles to drive on. You're talking of countering/nullifying the normal force - but you still have to counter the downforce (so gravity basically). It would not change the maximum speed, but accelerating would be very hard, which would make this a tedious experience. Besides, you would be barely able to stand still. Either you accelerate, either your brake and then you start falling/sliding down. I would see this only on some very short sections of the tracks. And assuming you also have speed pads on the beginning of the tunnel. Typically, I would see this kind of stuff organized in a looping-like pattern, but with the vertical slope being extended (instead of just going around). The big problem is what happens if you fall.. You would lose a bunch of time. And more than likely hinder the race for the mates that are behind you. potterman28wxcv wrote: You're talking of countering/nullifying the normal force - but you still have to counter the downforce (so gravity basically). 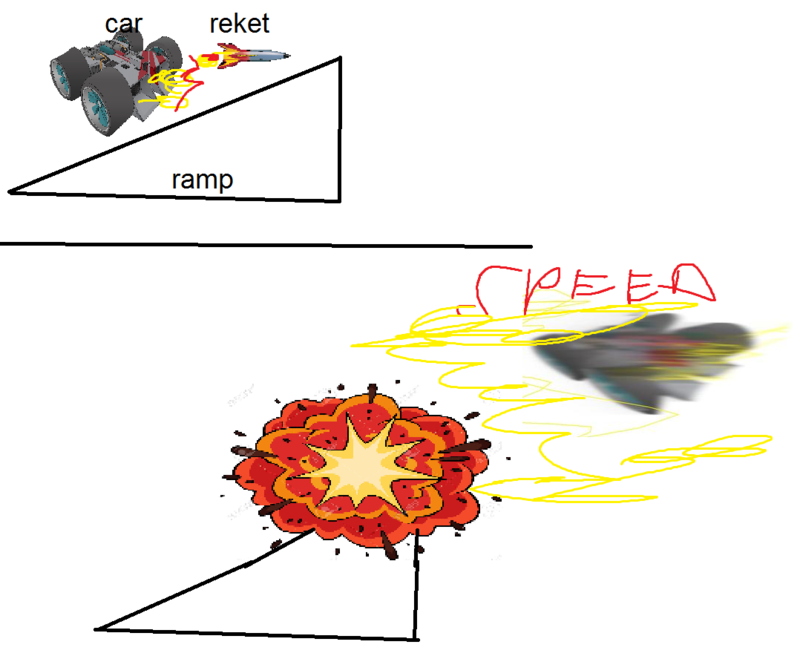 Whoeps yeah most of my explanations are based on downforce. The Van Der Whaals one doesn't and the super-sticky surface wouldn't either. I would go for the Van Der Whaals force, it doesn't hold the vehicle back when driving and (I think) work the same as a normal car being pressed against the road similar to... Well Magnetism so basically you could just go for magnetism. potterman28wxcv wrote: I would see this only on some very short sections of the tracks. And assuming you also have speed pads on the beginning of the tunnel. Yes my idea would be to have these type of grip area's only in highly specific pieces of road. I have no problems with mates needing to avoid other players on their way down. What I do have a problem with is the loads of time you lose compared to any other part of the track, that's why I came up with a gripping surface on these area's so that you would grab the track and be able to recover faster. Or we can have....manual GRIP engine that increase/decrease downforce but affect speed. At max downforce you "stick" to the surface and cant be dropped....but also go slower. Also you can increase it midair to "magnetize" yourself back to track. This feature might also be affected by some parts of the track....For example Vertical tunnel can "buff" your GRIP engine so you could stick to walls harder and even if knocked down by rocket you will magnetise back to track real fast. Like the thrusters in distance.